If you've read this blog or my previous one (Alternate Tales from the West Coast Cafe), you'll be familiar with The Lady in Red who watched over Victoria's Fishermans Wharf from above. Over the years, I took many photos of her in different outfits. I never wanted to ask her caretakers about her, preferring her origins and purpose to remain mysterious. In my mind, I imagined her as a guardian angel looking after visitors to the community. Some weeks ago, I was upset to see that she had disappeared from her customary spot on high. I made it a mission to return to see if she had truly disappeared, or was just off somewhere getting "cosmetic surgery". 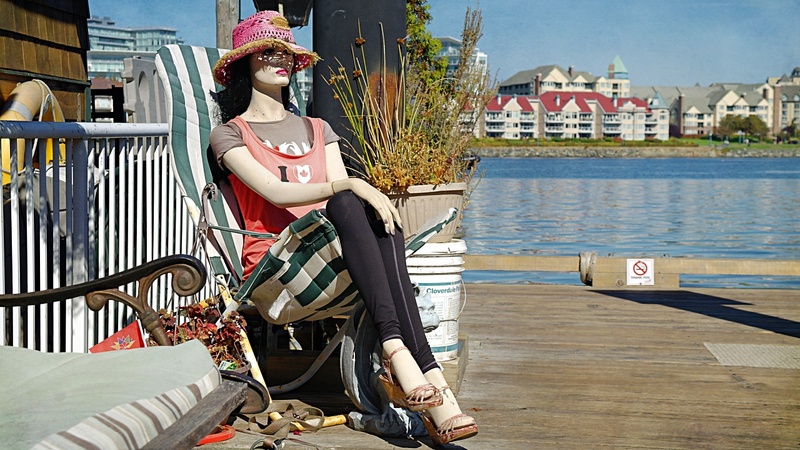 About ten days ago, I returned to Fishermans Wharf and was disappointed to see that she was well and truly gone. The houseboat that had previously been her home for years was freshly painted, suggesting new ownership. I guess the Lady in Red wasn't welcome anymore. Somewhat disappointed, I decided to wander the jetties for other photos opportunities. Surprise! The Lady wasn't gone... she had found a new home (with a new ensemble, doncha know) at the end of the jetty outside the door of another houseboat. I'm glad that she'll still be around for awhile yet, but I've decided to "let her go" so to speak... she won't be making any more appearances in this blog. Now that she has been discovered by tourists who are posing with her at her new location, I feel like our special connection has come and gone.